When Congress passed the Endangered Species Act (ESA) in 1973, it recognized that our rich natural heritage is of "esthetic, ecological, educational, recreational, and scientific value to our Nation and its people." It further expressed concern that many of our nation's native plants and animals were in danger of becoming extinct, including wolves. With the exception of the red wolf and mexican gray wolf, the USFWS determined the wolves a recovered species in 2013, proclaiming that "the current listing for gray wolf, developed 35 years ago, erroneously included large geographical areas outside the species' historical range". The wolf cannot possibly be considered a recovered species when the estimated population is only 5,000 in the lower 48, occupies just 5 percent of their historic range and when the Endangered Species Act dictates wolves be restored to a "significant portion" of that original range before they are ready for delisting. "Historic range", which, broadly stated, refers to the area a species occupied before humans began exterminating them. Yet in an interview with Lance Richardson, the Assistant Director for Endangered Species at the FWS, Gary Frazier said: "Range, is the range at the time at which we're making a determination of whether a species is threatened or endangered." In other words, range is where an animal lives at the particular moment the Fish and Wildlife Service decides to list it, not where it used to live before it was widely persecuted. This notion, coupled with delisting because of a taxonomic revision, a revision Fish and Wildlife Service previously rejected as representing "neither a scientific consensus nor the majority opinion of researchers on the taxonomy of wolves" is plainly undermining the ESA, as well as a convenient way for the USFWS to delist the gray wolf. History has demonstrated that societal values ultimately determine the survival of a species as controversial as the wolf. Wolf management evokes a wide range of public attitudes, polarized views, and prolonged contention. The future of the American gray wolf may become very grim as the war against the wolf continues with Congress' aggressive, officious interference in wolf conservation with proposed legislation that undermines the Endangered Species Act. Politicians should not be injecting themselves (with recently introduced anti-wolf legislation H.R.843, H.R.884 and H.R.1985) into what should be a science-based decision. The proposed legislation would reverse court orders, wiping out Endangered Species Act protection for approximately 4,000 wolves that live in four states (Wyoming and the western Great Lakes states). Wolves were rescued from the brink of extinction in the 1970s. But in 2011 the government began stripping their protection under the Endangered Species Act, which transferred "management" to the states, and by December 2014 over 3,400 wolves had been slaughtered in just six states. In 2011 a policy rider, (the first time legislation has ever removed ESA protections for a species) on a key appropriations bill, stripped Endangered Species Act protections for gray wolves in Montana and Idaho, and is very similar to the recently introduced legislation. That rider negated a federal court decision overturning the Fish and Wildlife Service's decision to delist gray wolves in those two states. The rider precluded the possibility of judicial review, making the delisting of wolves in Montana and Idaho virtually permanent (the delisting was enabled by an unprecedented legal maneuver in which legislators from Montana and Idaho circumvented the usual delisting process by attaching a rider to a federal budget resolution. Not only did the rider effectively remove federal protection from gray wolves, but it also ensured that this decision could not be challenged in federal court). In the three years that followed, more than 1,956 wolves had been killed in the two states. Reid Ribble (Republican member of Congress representing Wisconsin's 8th District) authored one of the aforementioned bills, HR 884, a bill which would allow the decision of the Fish & Wildlife Service to delist the gray wolf from the Endangered Species Act to stand. Reid Ribble states in a recent op-ed: "It is my belief that allowing trained professionals to make decisions based on years of research is the best path forward in achieving that goal, and my legislation, HR 884, would do just that. "Reid Ribble also stated:"I am pursuing a bipartisan legislative fix that will allow the Great Lakes states to continue the effective work they are doing in managing wolf populations without tying the hands of the Fish and Wildlife Service or undermining the Endangered Species Act." Yet the horrific slaughter of wolves directly after delisting in Reid Ribbles' Wisconsin was an abomination. One would indeed call it "effective work" if the goal was to extirpate the wolves.In Wisconsin, the population of wolves was just 800 in 2011, yet in a matter of three years (since delisting), Wisconsin has lost at least 518 wolves to legalized hunting, hounding, trapping and annual unenforced quota overkills.The 518 wolves killed does not include wolves killed at the request of livestock operators for "depredation control" (170) or wolves killed on roadways every year (25). In addition, it is difficult for agency staff to estimate how many wolves are poached, which is estimated, conservatively at 100 a year. Considering annual wolf pup mortality at 75 percent, and the human take of wolves in Wisconsin, this has been a disaster of catastrophic proportions. Hardly a wolf management plan integrating the "best available science". This moral bankruptcy and ineptness is not a way to treat a species recently removed from the ESA. Wolves have been feared, hated, and persecuted for hundreds of years in North America. In an attempt to extirpate them permanently from the landscape, wolves were hunted venomously (poisoned, trapped, snared, and shot from helicopters). This centuries-long extermination campaign nearly wiped out the gray wolf in the lower 48 by 1950. 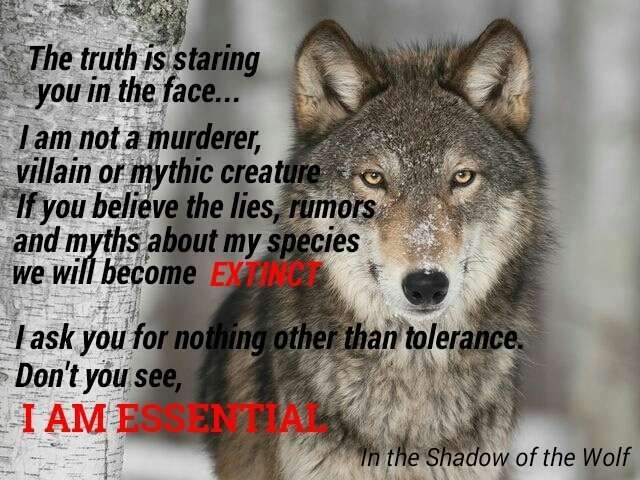 Sadly, wolves disappeared from most of their former range, today occupying only 5 percent of it. After three decades of federal protection, the safety net of the Endangered Species Act, and painstaking efforts of federal biologists, the wolf was able to return to portions of its native range. Gray wolves are now just beginning to reestablish stable populations needed for genetic sustainability, and although wolves have recovered in some states, the North American population as a whole is nowhere near "recovered". Judges have repeatedly overturned rules which were stripping wolves of their federal protection.In December 2014, U.S. District Judge Beryl Howell said the management plans of the three states that allow sport hunting of the wolf (Wisconsin, Michigan and Minnesota) don't provide enough protection, and noted that the animal had not repopulated its historic range. With such a small percent of suitable wolf habitat currently occupied and almost constant threats to their survival, these apex predators still urgently need the Act's protection to survive. Adversaries of wolf protective legislation continue their court battles against the wolves, but now those on the side of the wolves have an important weapon in their arsenal - the restoration of entire ecosystems (even if such benefits are not immediately obvious). Disruption of large carnivore populations has led to crop damage, altered stream structures, and changes to the abundance and diversity of birds, mammals, reptiles and invertebrates. Game animal populations have greatly increased without large carnivores, crippling the growth of young trees and reducing biodiversity. This also contributes to deforestation and results in less carbon sequestration, a potential concern with climate change.In order to maintain the resiliency of forest ecosystems, (especially in the face of a rapidly changing climate), the recovery and preservation of large carnivores is essential. Wolves are endangered in most of the nation and need continued protection to survive and recover.The wolf, a highly social animal is in peril. Hunted down relentlessly, the wolf mourns the loss of family members viciously and unethically trapped, snared, and murdered in droves.He must run for his life daily, year after endless year because man"kind" will not be bothered by the small concessions it would take to oversee harmonious coexistence. Lost in these bitter arguments over wolf management is any attempt to clarify state agencies' obligation to their citizens. Scientists and conservationists assert that wolf populations are not yet viable, and that distributions are not sufficient to constitute recovery. More importantly, existing regulations are not adequate enough protection to ensure persistence of population numbers.The Wildlife Trust Doctrine, a branch of the Public Trust Doctrine, defines the obligation of the states responsibility and obligation to its citizens, and dictates that wildlife has no owners at all, and therefore belongs to all citizens equally. As a result, states have a "sovereign trust obligation" to ensure that wildlife resources are protected and managed responsibly, not just for the benefit of current citizens, but also over the long term.The Wildlife Trust Doctrine imposes a duty to ensure proper protection for the gray wolf, as well as any other species no longer (or never) protected by the federal government. 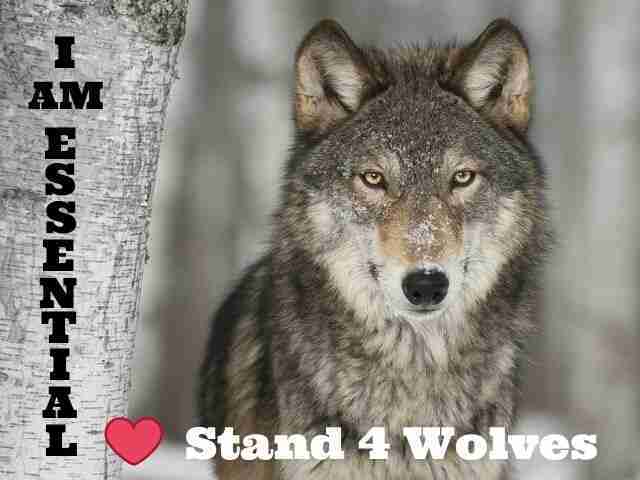 This has become a war on wolves, with the wolves suffering terribly. Now is the time for Americans to step up and be a voice for the protection of this beautiful, amazing and iconic species before it is too late, and before we lose them. Political greed should never prevail over sound science. Please contact your congressional members and be a voice for the voiceless, be a voice for the gray wolf.